2) Mix all ingredients and cook in a pot until boils. Boil for another 3 minutes using low heat. 3) Pour it onto mould and set aside to cool. 1.）Cook water with all ingredients (except corn paste) till boil, add in corn paste and set aside. 2) Pour ¼ of (1) into mould and set aside to fool. 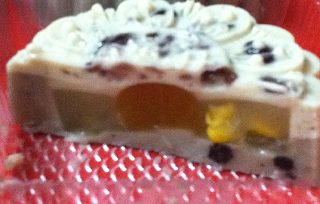 When the mixture form a layer on top, put in egg yolk and pour the remaining of (1) until the mould is full. Set aside to cool. 1) Put all ingredients (A) into pot and let it boil for 3 minutes. 2) Add in ingredients (B) and mix well. 4) Set aside and let cool. Put in the fridge overnight. Beautiful mooncakes! Look so attractive too.